Are you the kind of guy that seems to pull off any haircut as if it were nothing? 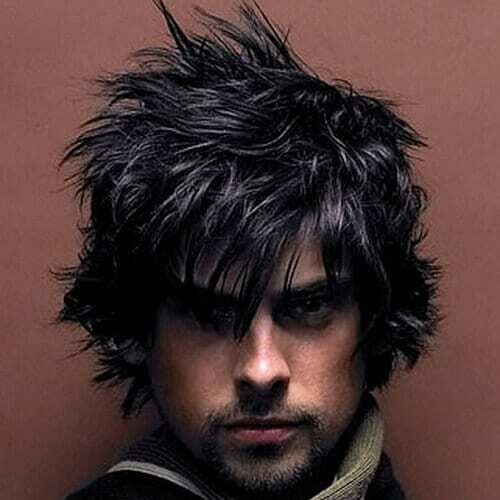 Then shaggy hairstyles for men are undoubtedly for you. Defined by a sense of stylish indifference, these haircuts are ideal for men who don’t want to spend ages getting ready for work or school. They’re easy to maintain and they look awesome, so go ahead and pick your favorite version below! We’ll kick off our selection with a shaggy hairstyle that can be worn in any social situation. As you can see in the photo above, the sides are shaved, leaving the shaggy part only on top. It’s an easy way to avoid a medium haircut. 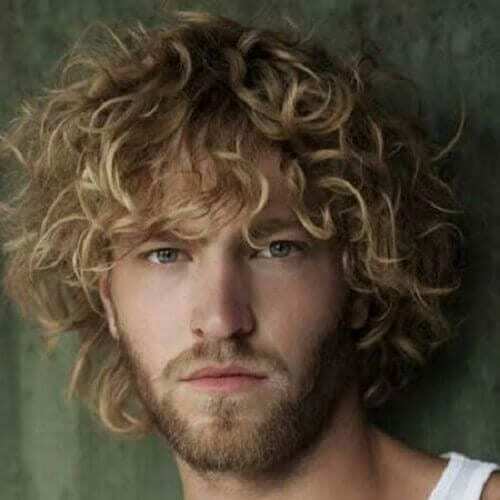 It’s almost impossible to find a shaggy hairstyle that doesn’t have a layered haircut. The layers, in fact, are what gives your locks the shag aspect in the first place. 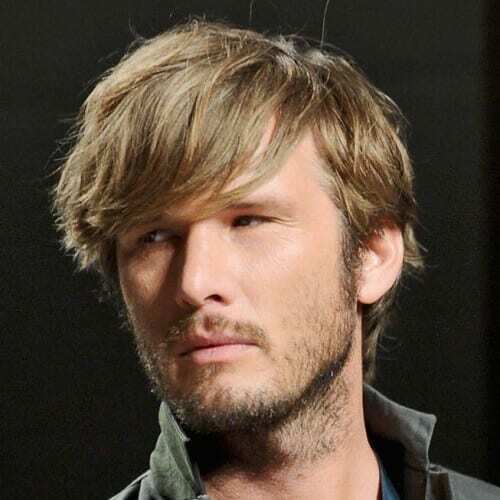 No matter what hair texture you have, don’t hold back on layers if you’re into shaggy hairstyles for men. Not all shaggy hairstyles have to come across as messy and rebellious. Actually, some of them can be quite classy, depending on how you style your hair. All you have to do is get a layered haircut and comb it neatly into place. 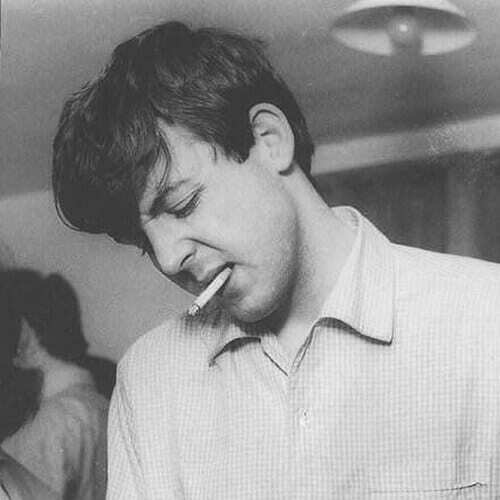 Still, that doesn’t mean that messy isn’t cool. We’ll be honest – it’s actually the coolest way for most men to wear their hair. 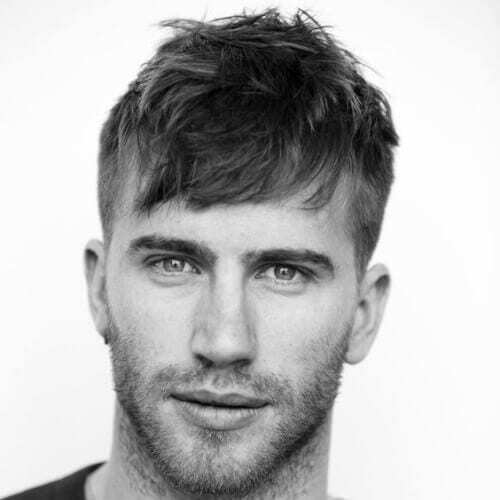 This brings us to the main benefit of having a shaggy haircut – you don’t have to struggle with styling or maintenance. 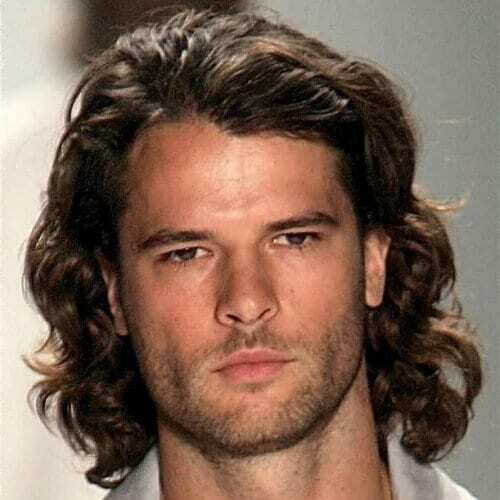 You’ll often see shaggy hairstyles for men with wavy or curly hair. However, they look just as handsome on guys that have naturally straight locks. You’ll actually have an easier time pulling off an elegant adaptation this way. 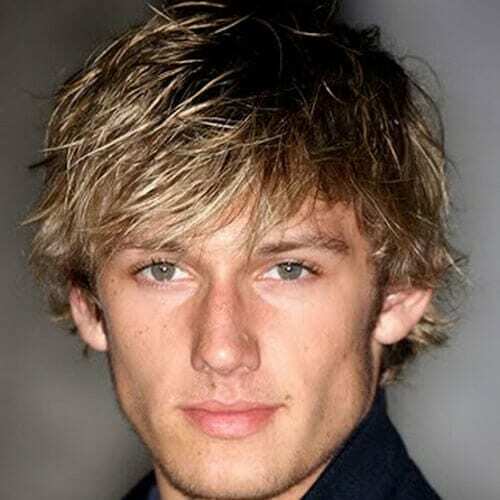 The concept of shaggy hairstyles usually leads us to believe that you need at least medium-length hair to have one. Nevertheless, you can rock one of these styles even if your hair is just an inch or two long. Bangs can help you achieve the outcome you’re looking for. 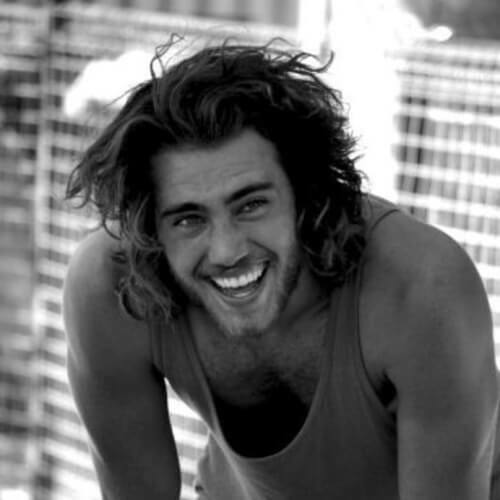 Surfers and skaters are usually the first types of guys that come to mind when thinking about shaggy hairstyles for men. 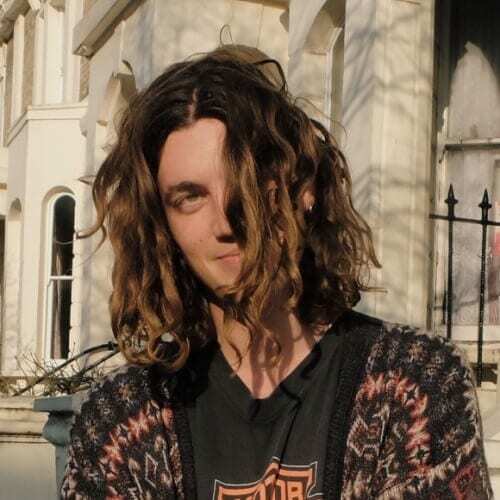 We’ll cover both, but let’s start with the typical surfer hairstyle. 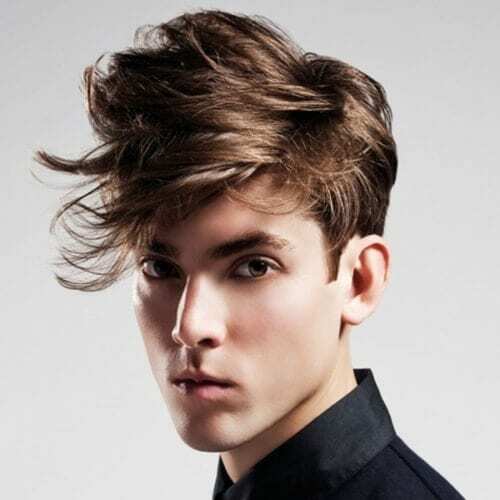 Casual and carefree all the way, this hairstyle is definitely for laid-back dudes. As you’ll soon come to know, bangs play a major role in nailing the shaggy style. You can style them any way you’d like, whether swept to the side or directly down your forehead. Just their mere existence will help you with this youthful look. Any extremes are hard to deal with, regardless if you’re talking about thin or thick hair. Be that as it may, a shaggy hairstyle can actually help bring dull, thin hair back to life. 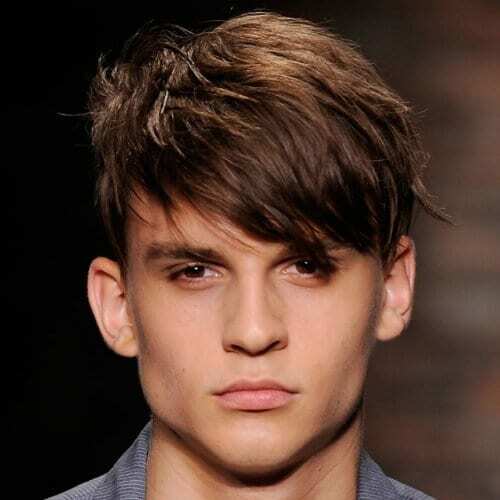 If you’re one of the guys struggling with thin hair, go for a shag haircut with wispy bangs. Who can forget the original trendsetters of the shag haircut? For your hairstyle, you may want to go back in time and gather inspiration from retro hairstyles. And what better place to start than with The Beatles themselves? 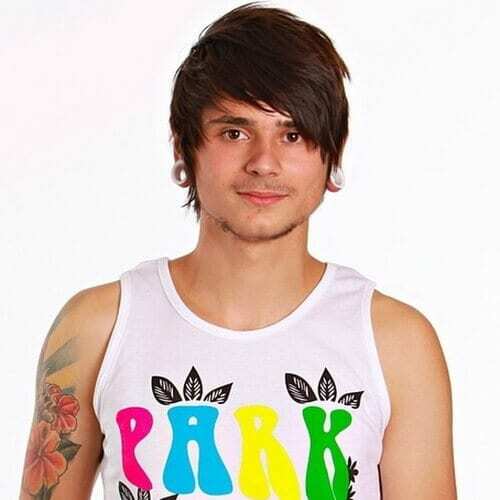 As promised, here is a regular example of a skater haircut with a shaggy hairstyle. It basically follows the same rules as the surfer one, just that it’s usually combed down a little more. Get one like this if you resonate with the associated lifestyle. 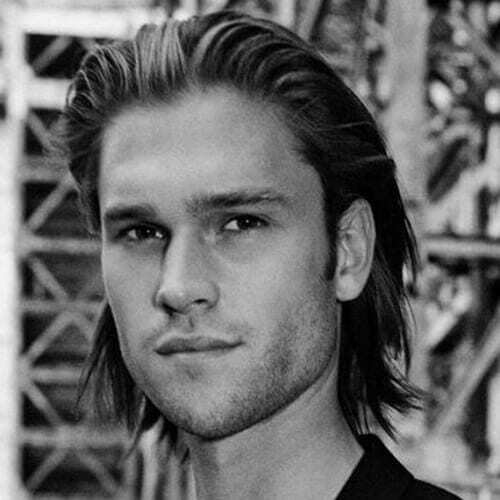 If you’re not afraid to sport longer locks, you may want to think about getting a shoulder-length hairstyle. Indeed, it might take a while for your hair to grow, but the results will be highly attractive. 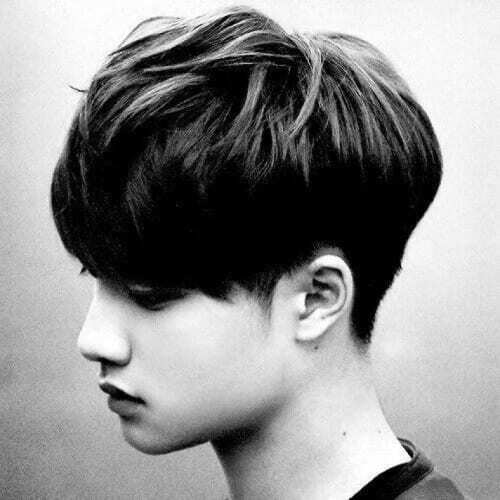 We recommend it for a manly and composed hairstyle. 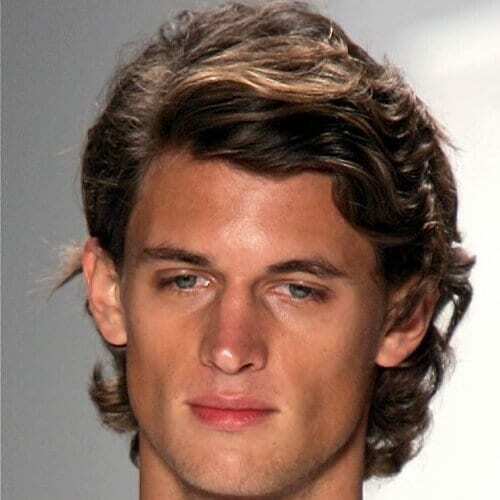 Curly hair provides one of the most helpful textures for shaggy hairstyles for men. Thanks to the way your strands twist and coil, the “shaggy” part of the haircut will be accomplished without any additional effort. Try medium as your length of choice. Like we said, thick hair can be just as tricky as thin hair. It all depends on how thick your locks are. If they’re thicker than you’d like them to may, you may want to stick to a shorter haircut. Add layers for the shaggy effect. Even though men may lack some hairstyling options that women have, there’s an advantage that’s exclusive to them: facial hair. That being said, you should keep your facial hair in mind when thinking about spicing up your shaggy haircut. Curly hair also results in a set of chill and easygoing bangs in an instant. Sure, they may get in your eyes if they’re kind of long, but at least you’ll look awesome. Make sure that you get layers all around for the hairstyle to work the way you want it to. You can get a similar look if you have straight hair too. However, if you decide on rocking longer bangs, we recommend sweeping them to the side in this case for obvious reasons. Alternatively, you can get asymmetrical bangs that are shorter across your forehead and longer to the side. As long as it’s styled in a casual and careless way, almost any messy hairstyle can be classified as shaggy. The same goes for the length of your hair. Your locks can be as long as you’d like; provided you put them together the right way, you’ll have a cool hairstyle indeed. 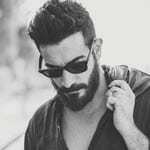 As far as shaggy hairstyles for men are in discussion, there’s a general guideline that applies to all: shorter layers will give you more texture. 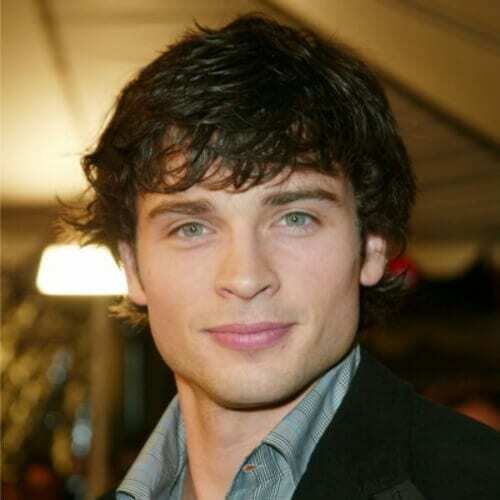 In saying that, you can have silky-soft fine hair and pump it up with the help of some short and choppy layers. 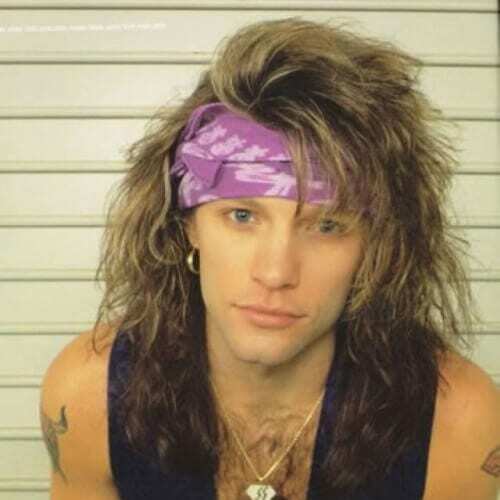 We doubt that 80s hairstyles like Bon Jovi’s frizzy ‘do in this photo will come back anytime soon, but we think the idea is fun and unruly. If you can’t deal with it on a daily basis, you may want to get this hairstyle for a themed party before cutting your hair short. 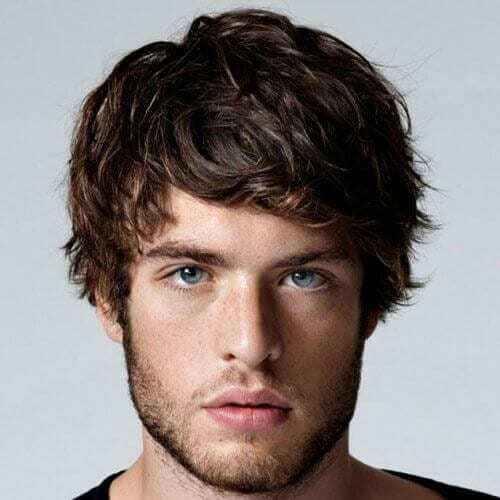 Volume can have a massive impact on any man’s hairstyle. Now, while some enjoy plenty of volume from their natural hair texture, others have a harder time obtaining it. What you can do to get closer to a voluminous hairstyle is to chop your hair into long layers and backcomb it. If you’re a teen, you can pull off shaggy hairstyles for men without a care in the world. The haircut itself is very age-appropriate for a guy in their teens, so you don’t have to worry about getting in trouble at school for it. On the other hand, you can use a shaggy hairstyle to bring out your youthful side at any age. Even if you’re over 40 or 50, this haircut has a knack for cutting at least a couple of years off your real age. 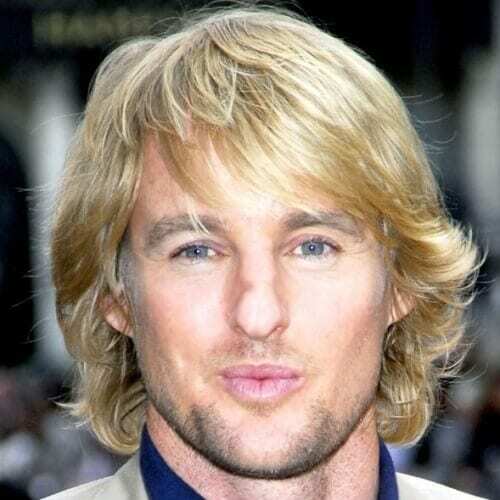 Just look at the seemingly never-aging Owen Wilson. Arguably the best way to sport a shaggy hairstyle is with shoulder-length hair. Top that all off with a naturally wavy hair texture and you literally have 0 reasons to worry. Forget about styling; your hair will look perfect from the minute you wake up. 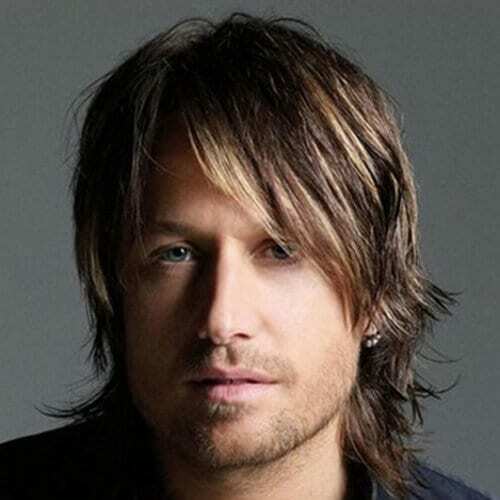 Keith Urban is yet another celebrity that has been looking good with a shaggy hairstyle for well over a decade. The New Zealand native tends to spice up his layered, shoulder-length haircut with a fresh set of honey blonde highlights. 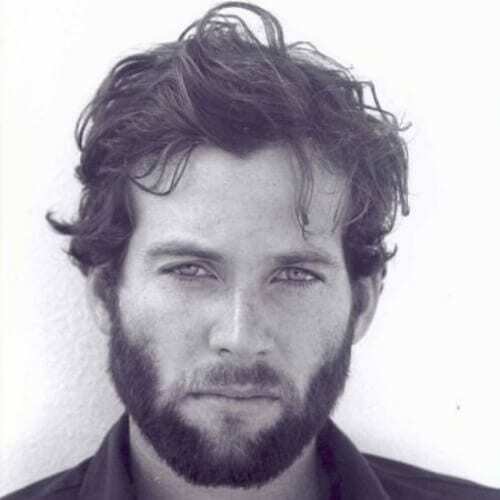 Any beard seems to flawlessly go hand in hand with a shaggy hairstyle. 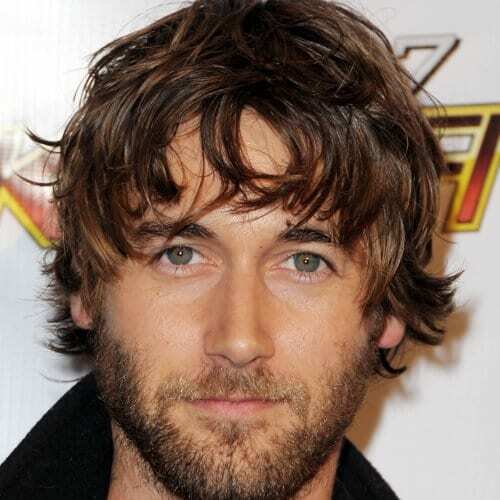 Notwithstanding, one of the best shaggy haircut and beard combos seem to be with a short, well-trimmed beard. 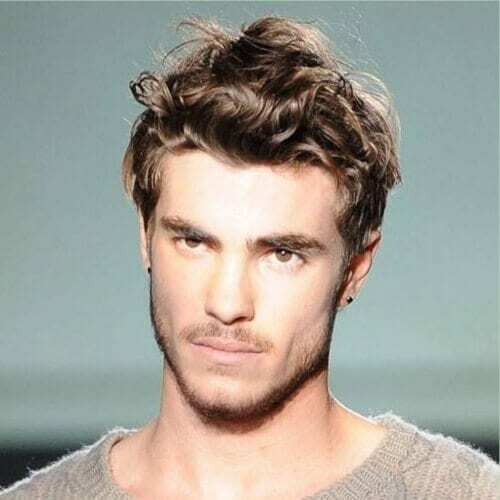 You’ll balance out the edge provided by the sloppy hairstyle. 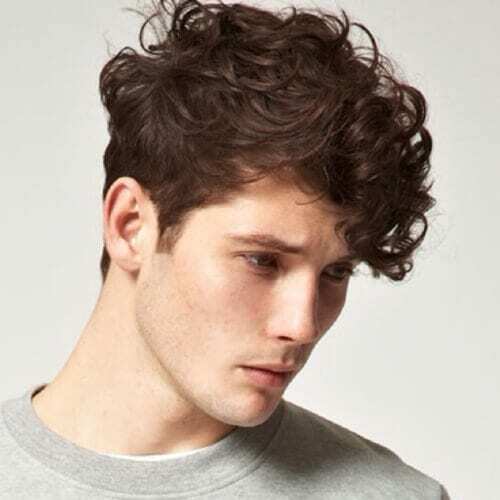 Here’s another nice idea for our curly guys. If you can’t stand keeping your curls long, you can get a short, fun, shaggy haircut to flatter them. You’ll still be showing off your interesting hair texture, all while rocking a relaxed hairstyle. 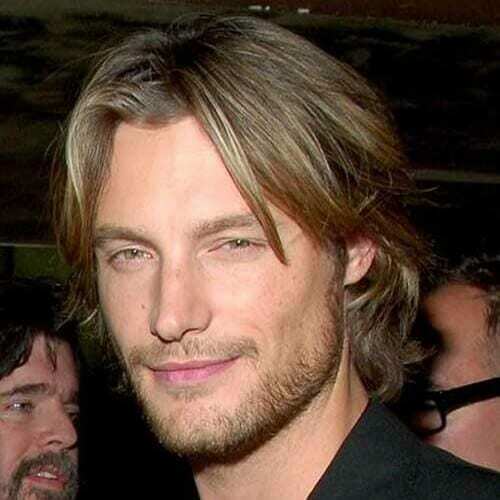 How can we forget the shaggy hairstyles of the 90s? It was a decade in which almost any guy seemed to have a Leonardo Dicaprio-inspired hairstyle (in his Titanic days), including actors like Matt LeBlanc. We think they’re still fashionable to this day. We recently wrote an article about the flow hairstyle and how it has pretty much taken over 2017. 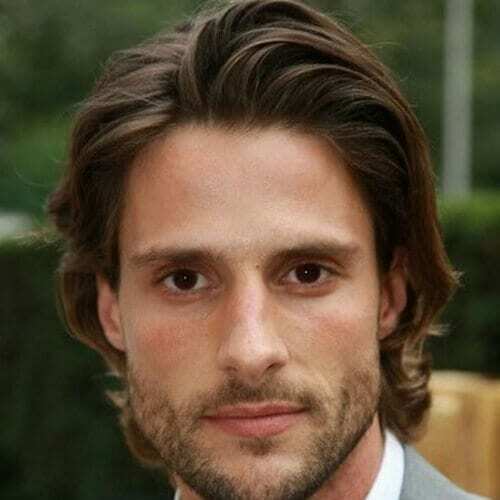 Well, to continue our claim, take a look at how appealing a flow hairstyle looks when combined with a shaggy one. 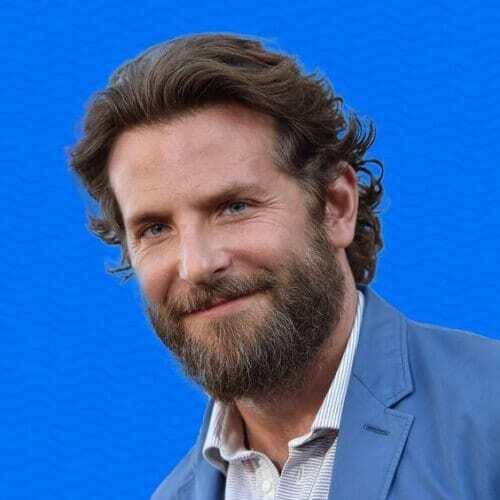 You can always count on Bradley Cooper for inspiration on this one. Afro-textured hair looks nothing less than outstanding when styled in a shaggy way. 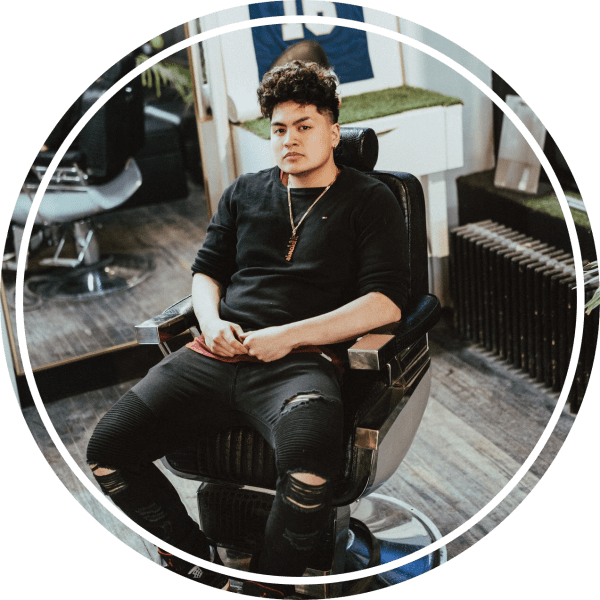 The texture itself helps you master the hairstyle more than anything, seeing that your curls will smoothly fall into place without you having to style them that way. If you have a bohemian soul, there are high chances that a shaggy hairstyle will suit you nicely. For all that, we recommend a slightly different approach. Instead of leaving your hair long or medium-length, consider cutting it shorter in the back and leaving the shaggy part for your bangs. On your average day, you won’t have to stress about styling a shaggy haircut. Still, there may come am morning in which it seems that your hair won’t look right no matter how you tousle it. For these emergencies, break the glass and pull out the hair gel. You can also use your product for a sleek twist on your shaggy hairstyle. If you get tired of it being all over the place, put some gel on the tips of your fingers and slick it back. It’s also a great idea for any formal events you may have to attend. Yet another way to switch around your shaggy hairstyle is to keep the bangs out of your face, for a change. We guarantee that you’ll get sick of them getting in your eyes at one point, so you may as well try this idea out for added comfort. Both scene and emo hairstyles are basically founded on the idea of a shaggy haircut. The most significant aspect of both looks is the bangs. They should be long, generously layered and fully swept to one side of your face. If you’re one of the 2% of the world’s redhead population, you should be proud to show it. 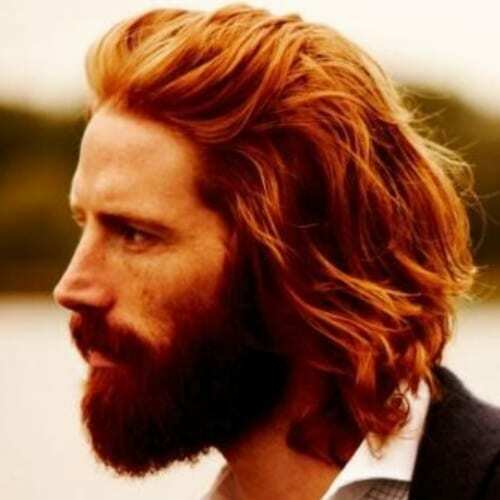 The good news for you is that a shaggy hairstyle is just what you need to add a rugged touch to your ginger locks. The beard isn’t a bad idea either. 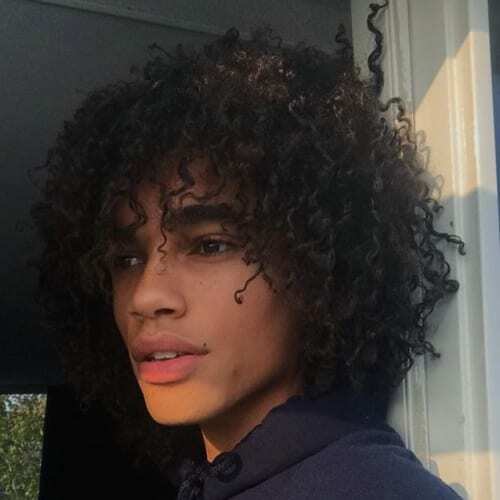 Despite the fact that the majority of shaggy hairstyles for men come complete with long bangs, others can look just as fine with short bangs. We particularly recommend this idea to guys who aren’t excited about having hair in their eyes all day. If you don’t want to slick back your shaggy locks, you can always just comb them back from time to time. It’s yet another clever idea if you have to trade your usually rebellious appearance for a fancy occasion. Faux hawks have taken the men’s hairstyle scene by storm in the last couple of years. They’re easy to style and they’ll have you looking like a bad boy in no time. To maintain a nonchalant vibe for yours, make sure you have a layered haircut as the foundation. What if you need a shaggy hairstyle that will work on the daily? Consider keeping your locks a tad shorter than you normally would. 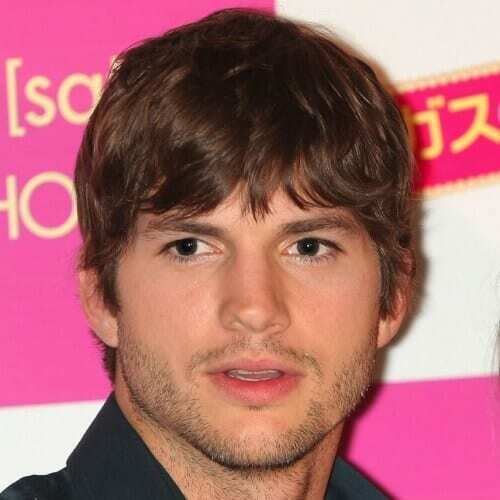 As you can see with Ashton Kutcher’s hairstyle in the photo above, you’ll get a versatile haircut to meet all of your day to day needs. 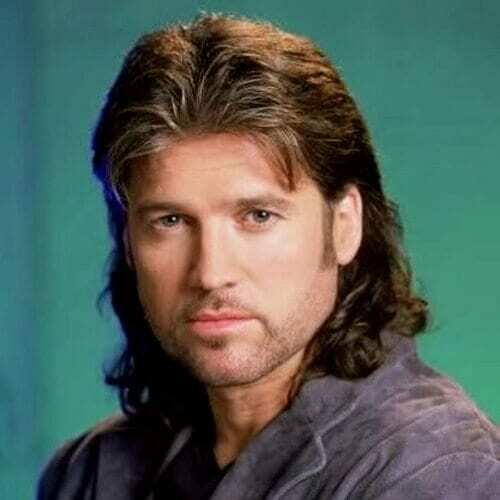 Ah, how could we forget the mullet? Just like Bon Jovi’s hair metal look that we presented before, Billy Ray Cyrus’ mullet will most likely not be among trends anytime soon. Still, you can get one if you’re nostalgic and it fits your personality. It’s time for the ultimate rebel haircut: the spiky and shaggy hairstyle. 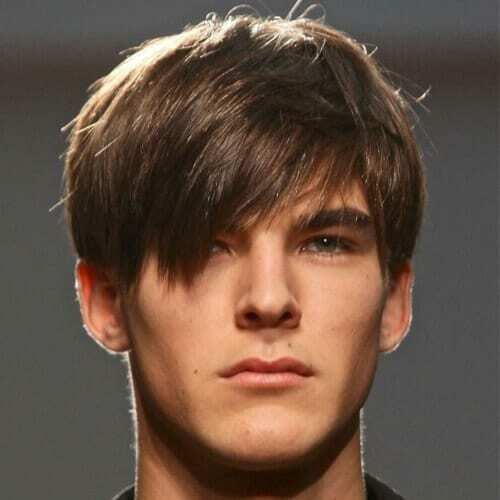 The base haircut comes with the messy look, while the spikes definitely make the hairstyle edgier. You can keep it in mind if you want to style your shaggy hair differently one day. We’ve talked all about shaggy hairstyles for men, but what about shaggy beards? 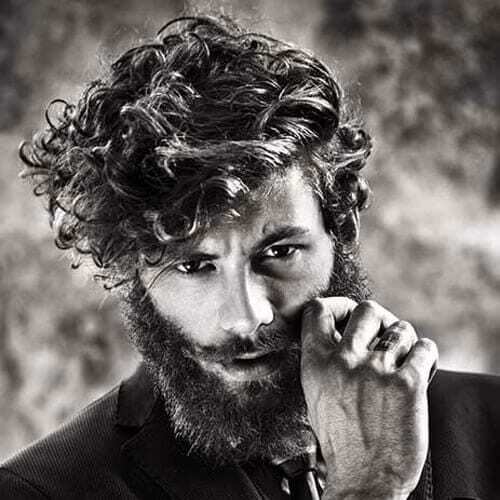 If you want to draw attention to your facial hair, let your beard grow naturally and untamed. Your hairstyle won’t even matter with such an eye-catching beard. Yep, the bowl cut is back, partially due to Asian hair trends. Nonetheless, it has returned with the perfect twist to give it a modern touch: shaggy layers. 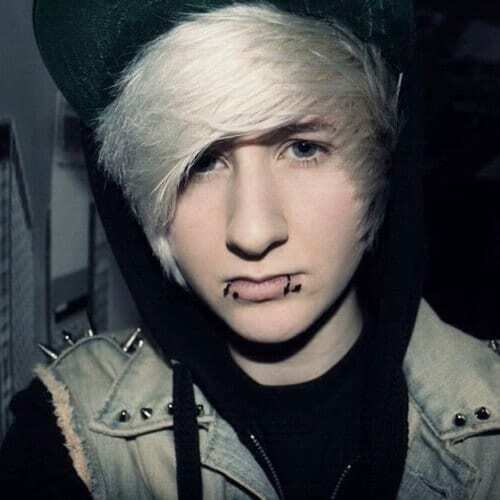 You should consider one if you want a boyish aspect to your hairstyle. 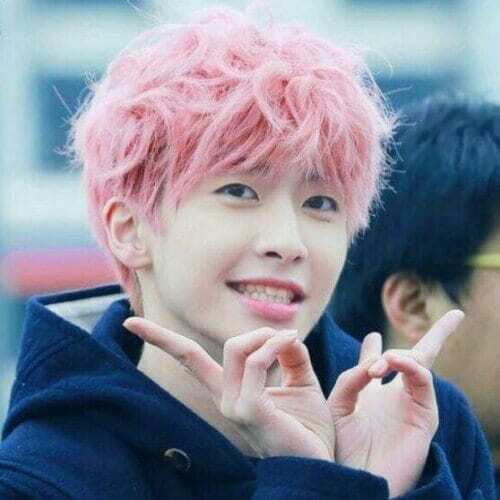 On the same note, dare to be eccentric with a K-pop-inspired hairstyle. 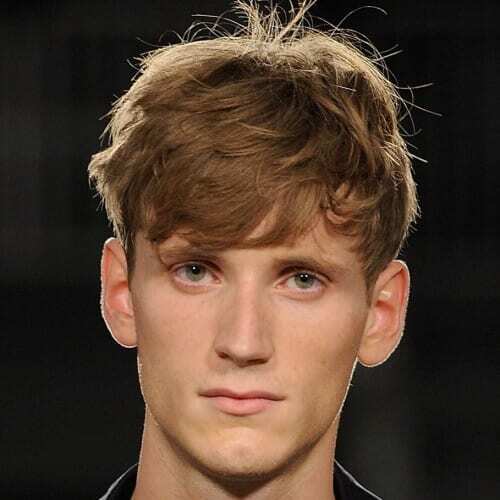 In essence, it takes the choppy bowl cut hairstyle we were talking earlier and brings it to a whole new level of color. Pink is just one idea, but feel free to explore all the tones of the rainbow. Most of the time, a classic combover hairstyle involves neatly cut hair that’s delicately brushed and slicked to one side. But when you have a longer, shaggy haircut, you can adapt the traditional style to your silhouette by combing your hair over. Considering that shaggy hairstyles first gained popularity decades ago, it’s natural that we would keep bringing up retro hairstyles. 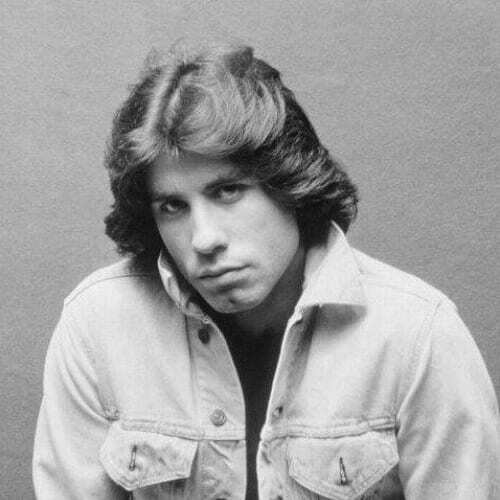 One to top them all is the feathered hairstyle that was popular back in the 70s, among celebrities like John Travolta. Can’t choose between making your hairstyle or your beard shaggy? Go for both of them! We support this full bohemian approach to your appearance, especially if you have an artistic personality. 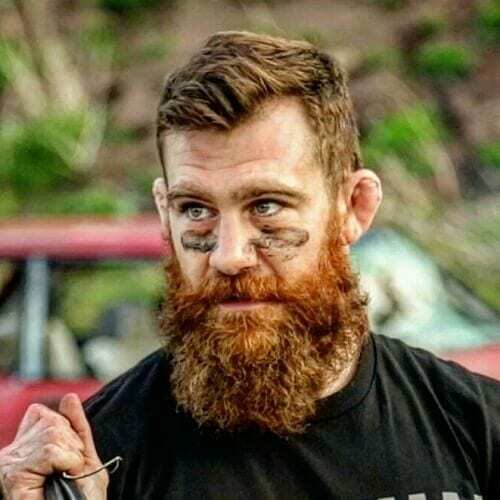 Keep the beard full and thick. Actor Connor Paolo is the perfect example of how you can tame a shaggy hairstyle and still look fly. It’s all in the way you get your hair cut, with all the right layers and angles. We guarantee that your family and coworkers will approve this one. Finally, you can mix your shaggy haircut with a popular hairstyle, such as the quiff. By combining the two hairstyles, you’ll get a successful blend of edgy and classy. In order to accomplish it, make sure your hair isn’t longer than 3-4 inches. 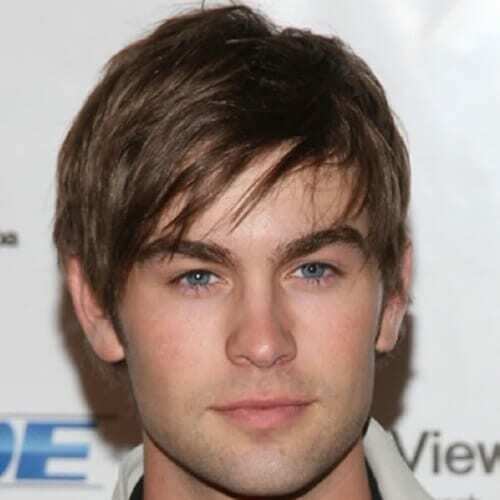 All in all, shaggy hairstyles for men are one of the most likable trends on today’s scene. You can find them everywhere, from celebrities to athletes, to the skater kid that lives next door. 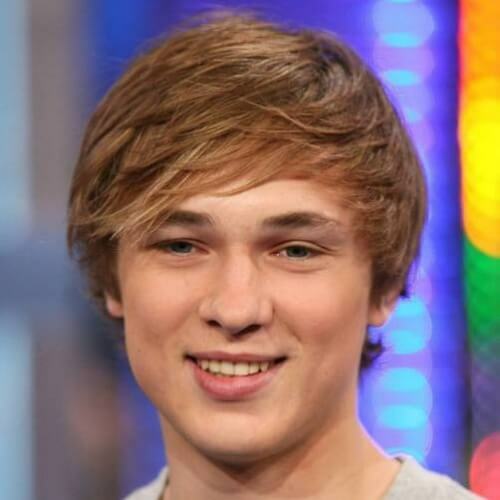 It doesn’t matter how young or old you are a shaggy hairstyle will bring out the best in your charming personality. Which one will you get?